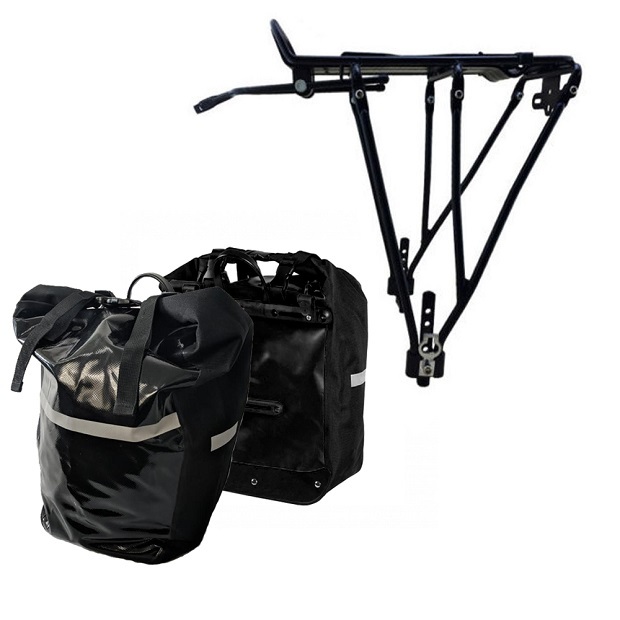 If you’re looking for a storage solution for your bike (so that you can bring all the necessary gear on your next ride) then pannier racks are arguably the ultimate solution. These pieces of bicycle equipment are easy to add, and you can attach them either to the front or the rear of your bike. Most manufacturers offer an attachment system that allows the bags to conveniently and easily be clipped off and on. There are several different types of rear rack for bike you’ll come across when shopping, and the ideal for you will depend on a few factors such as the amount of weight you’ll want to carry, the type of your bike, and your frame. Some types of pannier racks won’t work with full-suspension frame mountain bike designs, so you might be somewhat limited in your options if you have a mountain bike. However, some road and touring bikes also feature specific attachment systems, like special eyelets onto which the pannier packs are bolted. The two most commonly used rear rack for bike are: wire-frame type (traditional), and those with alternative (non-traditional) mounting methods. Traditional pannier racks are bolted onto special eyelets that are welded onto the bike’s frame, and attached to the brake mounts as well. As previously mentioned, mountain bikes typically don’t feature these eyelets, but most touring and road bikes do. Furthermore, the advert of disc brakes and the rear and front suspension has made these pannier racks incompatible with most off-road bicycles. Non-traditional pannier packs, on the other hand, are specifically built to overcome the struggles you might have with traditional pannier racks. They’re typically mounted either by a clamp on the seat tube, or a special brace that is attached to the seatstay, so it doesn’t interfere with the suspension compression or the disc brake rotors. So before buying, you want to check for a couple of things. First and foremost, see whether your bike has rack eyelets on its frame. If it doesn’t, you need a rack with a non-traditional mounting method. If you have disc brakes, see whether the rack is compatible with them. Moreover, check the maximum load limit of the rack and whether the rack itself is compatible with your panniers (if you own them already). Once you’ve taken all of this into consideration, you should be properly equipped to make a smart buying decision that will increase your bike’s load capacity and improve your next on- or off-road experience.